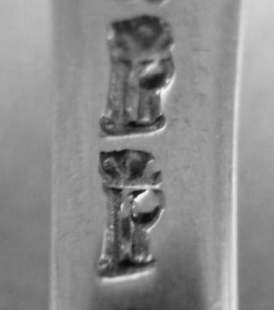 During a recent review of a private collector, regarding a table service, I discovered an exceptional silver item bearing faked hallmarks struck by the maker himself in order to escape silver taxes and warranty payments. 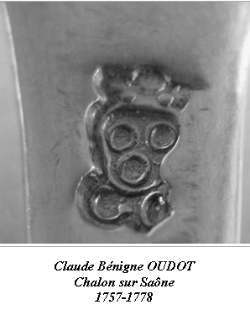 In spite of its false marks, the fork, which is made of plain silver (a model called "uniplat") may be dated 1762-1768 and was produced in the Burgundian town of Chalon-sur-Saône. 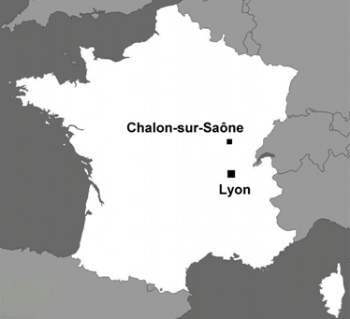 During that time, the town of Chalon belonged to the Bourgogne (Burgundy) region whose capital is DIJON. Chalon is located ca. 130 kilometres to the north of LYON. During the eighteenth century, there were usually six silver workshops in Chalon. This article is exploring the legal rules surrounding silver hall-marks during the reign of Louis XV and the way used by the silversmith to cheat them. - the Discharge mark is struck on the finished item, confirming this payment, hence "discharging" the item from any further tax submission. Furthermore, makers are compulsorily required to let their own guilds test the purity of silver and pay a fee for this assay. The latter is organized by elected silversmiths that are for some time the wards ("Gardes") allowing allowed to strike a Warranty mark. 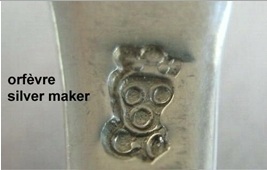 To summarize, one may find on French silver items 4 marks that are stamped chronologically in the following order: the maker’s mark in first place, together with the Charge, then the Warranty, and the Discharge completing the hallmarking procedure. The town of Chalon-sur-Saône in Burgundy is committed to follow such rules. 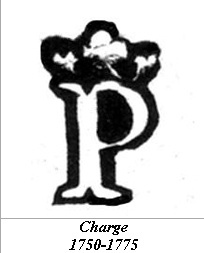 Charge and Discharge marks are commonly employed from the end of the seventeenth century. The Warranty mark has the shape of a capital letter, crowned, and is regularly modified when new wards are elected. At the time the fork is sold, the long reign of King Louis XV (who dies in 1774) is finishing in a very bad state. The poor state of the economy is pushing the authorities to drastically increase taxes in the whole kingdom. Including fees for the warranty issue, all taxes may account for about half the price paid to the makers by their own customers!! A huge cost that may explain why silversmiths are trying to cheat on these taxes. The fork is in plain silver, there are no armorials engraved on the spatula. There is no monogram either. Its teeth are in very good state, still very sharp ones. This item is twenty centimetres long, its weight 73 grams. I am showing below the different marks stamped in their order displayed on the handle. The marks are still in a very good state, neither damaged nor erased. 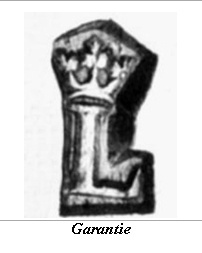 The stamp is showing: the letters C and O (a point in between) that are his initials, under the crowned armorial bearings of Chalon containing three little rings. This silversmith was registered in Chalon in 1757, his activity was pursued until 1778. An antique crowned P imitating the authentic stamp. The same antique P that is cheating the genuine warranty mark. 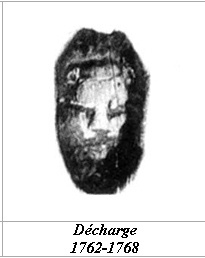 Last, but not least, a feline head that is astonishingly imitating the authentic discharge mark. The third false mark. 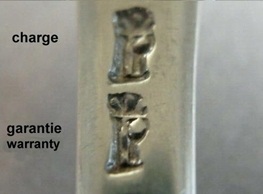 The fork was later stamped with a mark called « Old Works » ("vieux ouvrages") between 1781 and 1789 (an authentic mark meaning that the item has been resold). - finally, Claude OUDOT creates his own discharge mark that is remarkably imitating the official one (feline head) used between 1762 and 1768 in Chalon. Please note that this mark hence allows giving a precise dating of this fraud. It seems that Mr OUDOT does not fear the numerous punishments attached with cheating the hallmarking system (being excluded from the corporation, ban or even death sentence). 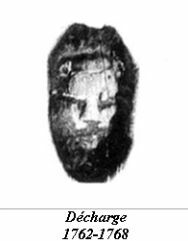 This fraud has been duly recorded and precisely described in a reference book that is part of the Cahiers du Patrimoine, n° 56, called "Les orfèvres de Bourgogne" (under the supervision of the Ministère de la Culture, 1999, ISBN 2-85822-272-X), pages 20 and 21. There is no doubt that such an item, in such a remarkable state, is a masterpiece in any private collection. A happy few.